Sennheiser's NoiseGard active noise cancellation lets you enjoy your music in peace. Trending at C $160.44eBay determines this price through a machine-learned model of the product's sale prices within the last 90 days. This elegantly minimalistic closed-back, around-ear headset also features Sennheiser NoiseGard active noise cancellation letting you enjoy music, movies or phone calls in peace – everywhere. Box has been opened to show contents, but these headphones have never even once been used. Noise Gard active noise cancellation reduces ambient noise levels, improving the listening experience. Item model number: HD 4.50 Special Edition. Item Weight: 8.3 ounces. 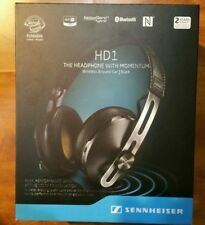 1x Sennheiser HD Wireless Headphone. Noise Gard active noise cancellation reduces ambient noise levels, improving the listening experience. HD 4.50 Special Edition. Color: Black. Condition: New. Includes connecting cable for battery-free listening. Brand new open box! Listen to playlists or podcasts in crystal clarity with these Sennheiser HD 1 headphones. The high-definition aptX codec lets you hear every detail, and the VoiceMax microphone and inline controls let you take phone calls from a connected mobile device. These Sennheiser HD 1 headphones have noise-canceling technology to keep out unwanted interruptions. Inspected, tested and verified brand new. Picture contains everything that's included. (Note) All international orders are as is with no refunds or exchanges due to the high cost of shipping. Please look at pictures and ask questions. I will do everything I can to help in you buy with confidence. Orders will be handled with care and packaged well. Trending at C $276.47eBay determines this price through a machine-learned model of the product's sale prices within the last 90 days. Tested and verified new. Pictures contains everything that's included. Sennheiser HD 4.40 BT's Bluetooth model HD 4.30. Wireless support: Bluetooth. Sensitivity: 113 dB (Passive: 1kHz/1Vrms). Bluetooth 4.0, NFC-enabled connection. Type: dynamic, closed. If you get it as quickly as possible. 1x Sennheiser HD Wireless Headphone. · Noise Gard active noise cancellation reduces ambient noise levels, improving the listening experience. HD 4.50 Special Edition. Color: Black. Condition: New. · Includes connecting cable for battery-free listening. Design, which channels the audio signal directly into your ears. Featuring a contemporary design that is both attractive and ergonomic. A real treat for all, who listen to their music with sense of discovery. Sennheiser PX210BT in good condition. Optimal Blend of All-Around Performance. Frequency Response : 10 Hz to 28 kHz. Impedance : 23 Ohms. • Fit Design: Neckband. • Type: Headphones. • Earpiece Design: Earbud (In Ear). • Connectivity: Wireless. • Features: Wireless. • Color: Black. The Sennheiser HD 1 headphones sport a cool throwback look, but have plenty of modern features. They cleverly fold into a bundle that's easier to take with you. They are made of rugged, heavy-duty parts like stainless steel sliders and a leather headband. Sennheiser HD1 Wireless Headphones wth Active Noise-Cancellation, Black. Condition is Used. Shipped with USPS Priority Mail. Original box, barely used. Perfect like new condition. They can be used to listen to music and take calls using Bluetooth 4.0 technology, and are compatible with smartphones, MP3 players, tablets, and other portable devices. 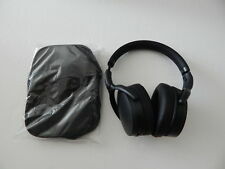 This is a listing for Sennheiser HD1 Bluetooth Wireless Around Ear Headphones. Items is open box and fully tested and inspected. Item comes in original box and includes instructions, USB charger, carrying bag, carrying case and 3.5 mm headphone jack and double pin plug-in attachment. Brand New Open Box The closed HD 569 with around ear design brings a flexible option to the Home entertainment space. It provides a rich and clear bass, adding further flexibility by making it possible to enjoy the full personal experience without disturbing others. International orders are sold as is no refunds or returns due to the high shipping cost. Please see photos and ask questions. I will do whatever I can to help you buy with confidence. Orders will be handled with care and packaged well. New Open Box Sennheiser HD1 In-Ear Wireless Headphones, Bluetooth 4.1 with Qualcomm Apt-X and AAC, NFC one touch pairing, 10 hour battery life, 1.5 hour fast USB charging, multi-connection to 2 devices. It is little discomfort in the tone of the weakened noise. It is noise cancellation is large and more. With Bluetooth (Bluetooth 4.0 compatible), it also supports Apt-x. shape Headphone head band. Headphone model Sealed type. Product details MPN: 506782. Das akustisch geschlossene, ohrumschließende Headset verfügt über Bluetooth 4.0 und ist aptX kompatibel - für echten Hi-Fi-Klang mit einem tiefen, dynamischen Bass. Sein elegantes, minimalistisches Design ist aus widerstandsfähigen, hochwertigen Materialien gefertigt. It features NFC for simple pairing of compatible devices. Wearing comfort is assured by their ergonomically designed ear pads. The HD 4.40 BT has excellent battery life, letting listeners enjoy wireless sound for up to 25 hours. Enjoy a rich sound performance you can take anywhere. Now you can experienceyour music to the full with all the freedom of wireless. You can even connect two devices at once. Sennheiser HD1 In-Ear Wireless Headphones, Bluetooth 4.1 with Qualcomm Apt-X and AAC, NFC one touch pairing, 10 hour battery life, 1.5 hour fast USB charging, multi-connection to 2 devices. Sennheiser HD1 In-Ear Wireless Headphones, Bluetooth 4.1 with Qualcomm Apt-X and AAC, NFC one touch pairing, 10 hour battery life, 1.5 hour fast USB charging, multi-connection to 2 devices. The HD1 In-Ear Wireless is a Bluetooth earphone with integrated three-button remote and high-quality microphone incorporated into the neckband. Sennheiser HD 4.40 BT, Bluetooth model of HD 4.30. Sennheiser HD 4.40 BT. Sealed Around Ear Headphones with a comfortable wearing feeling realize balanced sound quality and abundant bass with their own Sennheiser drivers. Sensitivity 113db Maximum Input Power /. Fit Design Over Head. Plug Mini plug Weight 265g. if your item had any problems such. We must work hard to solve. the problem and make it right. We promise to work hard on. Model: Sennheiser CX Sport. Bluetooth 4.2 with multi-point connectivity. Bluetooth 4.2 with multi-point connectivity allows pairing with eight (8) devices and simultaneous connection with two (2) devices. Wireless headphones is compatible with Bluetooth 4.0, NFC, apt-X. Fit Design Over Head. since Jul 7th 2002. if your item had any problems such. We must work hard to solve. the problem and make it right. Item model number: HD1 AEi Black. The HD 1 AEi headset brings signature Sennheiser sound to an updated iconic design. The new folding headband design provides greater portability. In-line smart 3 button remote and mic on the cable are compatible with Apple iOS devices.